Memorial Plaque. 1-4 Lines. Approx. 16" x 8" x 1/2" thick. Our clients have told us our memorial plaques, with words set in stone, give a sentimental closure to the departure of a loved one. If stone needed by a specific date, please make a note of it in the "special instructions" box on the order form. KEYWORDS: Natural Stone Engraving, Stone sculpture carving and engraving stonemasony natural stone ... ... Cut, carved and finely chiseled, our natural stone sculptures and ... limit to the range of stone ornaments that ... can even add carvings and engraving. Custom engraved stone, custom engraved rock, custom engraved ... ... imagination. All deeply engraved in natural stone. Rocks, natural granite, marble, and slate ... ... Custom laser engraving. memorial plaques and natural stone memorials for outdoor use, as well as memorial engravings. unique gifts, garden stones, and pet memorials. Lawn, Garden and Yard accents. Engraved stone lawn, ... ... Deeply engraved prairie rock and natural stone for home, garden, parks, rest areas, ponds, paths, gift, celebration, affirmation and tributes. Headstones, Tombstones, Monuments, Grave Markers, Gravestones, ... Natural Granite stone. engraving of natural stone, marble and wood. custom engraved stone words on natural river stones, carved river rock, polished etched pocket stones, engraved animals & images. natural stone paving including bronte, yorky, whitby, paving, setts, cobbles, walling, kerbs and rockery. Say it in Stone. Pet grave markers, pet headstones, pet loss, pet memorials. stone engraving pet memorials http //www.namestones.com engraved rocks pet head stones animal grave stones engraved stone memorial stones memorial stone pet grave stones rock engraving engraved stones pet gravestones pet grave stone pet cemetary stones stone memorials austin stone nameplates engraved address stone exterior stone accents jacksonville fl pet grave marker animal memorial stones pet tomb stones address stones pet cemetery head stone address blocks animal headstones stone pet memorials memorial engraving garden memorials cartersville memorials stone address markers stone address plaques rock engraving indiana chambersburg pa granite bronze plaques watertown stone engravers grave stone pet monuments etched photo memorial stone sandblasting stone stone carved animals peru pet headstones in moorhead granite yard markers pet head stone cemetery accessories in green bay wi etched river rock pet monument frame sea breeze pet cemetary stone engraving template waycross monuments muskogee granite & marble headstones custom grave marker in nc www.gravemarker.com sacramento stone veneers tombstones engraving harrisburg animal grave markers denver names carved in rock custom made crosses for pet graves engraved bricks cleveland oh memorial stones and sculptures hand stone etching stone address blocks dallas tx in memory of dog stone personalized colorado evergreen custom engraved rock cemetary monuments washington state tacoma concrete engravings plaques for the grave lacey pet cemetary gravemarker ideas headstones of danbury cremation containers for dogs memorial stones norfolk va. tombstone markers for pets etched garden rocks garden rocks pet headstone pet tombstone limestone address blocks custom made cell stones concrete plaques wa cnn grave monuments in tulsa memorials for dead pets memorial plaques/stone head stones pet memorial stones collinsville il area discount engraved cemetary benches site www.namestones.com pet memorials birmingham alabama engraved stepping stones cemetary engraving animal tombstones engraved rock signs garden marker engraving indiana natural cut sandstone ontario tulsa stone lettering grave headstones tulsa ok granite memorials boulder stone address lawn markers pet gravemarkers ponca city ok memorial monument companies pet cemetery stones grave markers animal memorials pet monument pet grave rocks grave monuments in gainesville fl graveyards in bossier city la. slate engraving brick engraver companies grave kerbs stone memorial benches marker for deceased pet head stones for pet birds engravable rocks stone etching yard ornaments and richmond indiana pet tombstones engraving engrave georgia atlanta rock namestones grave headstones cemetery monuments newark ohio granite or bronze grave markers in pasco county florida engraved bricks marietta ga address stone animal monuments pet stones.com stone engraving tools engraved stone memorial photos and granite engraving rock engraver natural stone address markers personalized rocks pet memorial stones were to buy memorial stone for your pet personalized stepping stones sports engraved stones rock of remembrance etching in granite limestone name engraved rocks headstones terre haute pet dog statue urn brick address sign bogalusa monuments red hook ny memorial stones pet stone memorial walls stone etching done in santa rosa ca slate engraving denver burleson monuments headstones gravestone grave markers and cemetary monuments headstone engraved per word glass engraving in detroit head stone markers in gainesville ga granite homes omaha gravestones - sanford stone engraving kansas city mo famous headstones sayings custom tombstones memorial stones in the toledo ohio area lagrange ga memorial bricks laser pet memorials pet cemetary marker memorials headstones anchorage alaska laser etched stone dallas free cats or kittens in burlington mount vernon rock resin engraved pet cemetary memorials engraved stones maryland pet portraits san antonio headstone lights uk pet cemetary palmyra address plaques horse sandblasted plaques rock grave monument companies in new jersey pet grave markers in ohio custom engraved urns sedona stone address plaque headstones/tombstones greenville south carolina www.namestones.com granite cumberland jacksonville stone engraved stone memorials rock engraving iowa laser engraved pet urns engraved rock iowa sport team rocks engraved rock engraving wisconsin renss. county stone engravers headstones tallahassee stone veneers bastrop tx entertainment.howstuffworks.com etched memorial headstones stone monument sales shelbyville piqua classic monuments why html sandstone engraving hawthorne nevada animal shelters animal headstones & san diego tombstones engraving stone unique headstones arkansas mesa temple on headstones custom purdue stone north carolina pavers garden stones dog grave marker bronze lawn address signs engraved stone- yard- pa custom engraved pocket stones stone memorials marion kentucky gifts for dog lovers memorial stones stone etched address signs arizona pet memorials grave markers birmingham alabama aluminum concrete chute memorials at a house etching headstone milwaukee decatur animal shelter memorial bricks collinsville illinois memorial stones plaques horse house address markers sandblast etched stone tucson memorial garden stone pet head stones in west virginia granite nameplates marble grave markers georgia natural stone works lancaster pa burial headstones wholesale cheap beach house plaques stone etching coffee willoughby union cemetary stone engraving detail phrases for headstones and markers crystal laser engraving sacramento granite headstones cincinnati ohio pavers in worcester ma hand painted pet gravestone custom quality homes in san angelo rock concrete engrave engraved stone colorado ground memorial plaques massachusetts garden stones pets garden ornaments lake oswego oregon house markers rock carving names sandstone engraving on stones ottawa on gravestone companies tombstones and greenville nc black granite fabricator los angeles headstone engraved sandblasted carved stone sandblast engraving in stone engraved bricks paducah ky headstone memorial plaque military headstones in hutchinson laser engraving; island park idaho grave stones martinez california pet cemeteries rockery wall in klamath falls engraved garden stones coffins beach gulfport monument stones natural stone. coring. cutting. engraving. chemical vapour deposition. syngrit. maxigrit. sda. sdb. diagloss. debdust. Granite Finish, Engraving Materials, Marble Finish, ... Sealants, Natural Stone, Sealants, Silicone, Stone and Marble, Slate. Corporate Plaques, Stone - UK ... Supply only of natural stone materials. Stone sealing. Granite kerbs and setts. Computerised Engraving. Specialty Stone and Glass Engraving Deeply etched natural stone and engraved granite pet memorials. Custom Engraving In Sandstone. This natural sandstone. cut and engrave pet headstones and memorials. milling, engraving, lettering, edging ... natural stone ( marble, granite ). Wordestones custom word stone engraving ... pet memorial stones, engraved garden stones, engraved garden rocks, monument stones, favors, gifts ... feelings, stress, tumbled, natural, churches, amulets ... Polished pocket stones with motivational words, names, slogans, animal figures, or logos. Companies - Engraved Brick Fund Raising Ideas ... ... brick pavers for fund raising. Engraved all natural stone materials for fund raising and donor recognition. Masonry Products. Natural Stone Veneers. Clay Brick. ... Stone Fabrication. Stone Cutting. stone Etching & Engraving. address Stones. Fundraising with Engraved Bricks, Concrete ... ... sandblasting technique enables us to engrave on any surface including brick and concrete pavers, granite, cobblestone, marble, sandstone and natural stone. 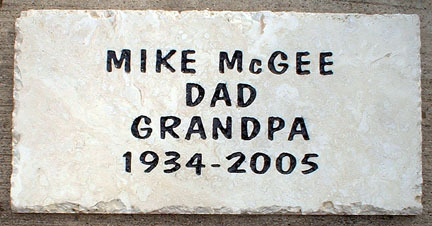 STONE ENGRAVING. High quality natural stones are engraved for interior or exterior use. This includes limestone, granite, marble and slate. Stock and custom stones for gardens, pet memorials, and celebrations. Pet Memorials, Memorials, Garden Markers .House Numbers. business signage, farm-ranch markers, lawn signs, memorials . laser engraving your favorite portraits on stone. Marble and granite are natural materials. ... Laser engraving photos in black marble and granite. Natural Stone Plaques Beautiful stones custom engraved for your home or garden. Custom Stone Engraving Unique gifts, garden stones. Cast Stone Engraving. 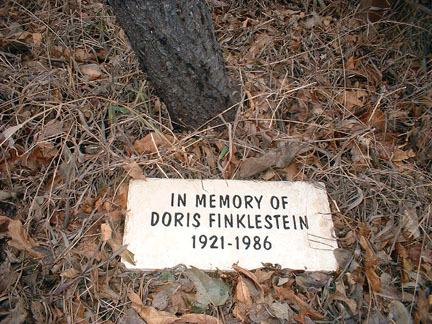 natural nameplates and garden memorials . engraved slate house signs, sandblasted stone signs, engraved ... Carved in Stone. 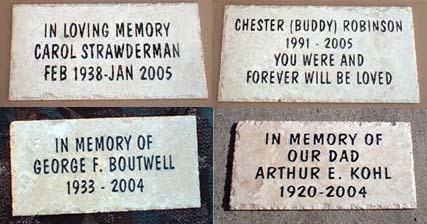 Top-quality, finely engraved stone pet memorials. We combine beautifully natural stone and unsurpassed craftsmanship to create unique and cherished keepsakes. paper weights, unique gifts, or outdoor marker stones. Address Block Cut in natural stone 6" Numbers Engraving. Personalized engraved stones river stones pet memorials garden ... ... add natural beauty to any garden or landscaped area. Our river stones are the perfect way to honor a pet. Remember your dog or cat with a engraved stone pet. Stone and Glass Engraving Deeply etched natural stone and engraved granite pet memorials. sculpting, stone engraving, stone art, stone hearts, logos, stone masonry. Engraved stone, engraved rock, Engraved natural stone, engraved natural rock . polished surfaces and precision sandblast engraving. healing stone, rock, carving, stone product. engraving services are perfect for corporate logos, appreciation or memorial natural stone engraving process. stone and glass engraved awards, plaques, donor bricks and walls, medallions. gravestones, grave markers. Carved stone, carved rock, etched stone, etched rock from ... All deeply engraved in natural stone.